Huge pulses of volcanic activity are likely to have played a key role in triggering the end-Triassic mass extinction, which set the scene for the age of the dinosaurs, according to new research. Dr Jessica Whiteside, Associate Professor of Geochemistry at the University of Southampton, worked with colleagues from Oxford and Exeter Universities to trace the global impact of major volcanic gas emissions and their link to the end of the Triassic Period. The findings, published in the Proceedings of the National Academy of Sciences of the United States of America (PNAS, DOI 10.1073/pnas.1705378114) directly link volcanism to the previously observed repeated large emissions of carbon dioxide that had a profound impact on the global climate, causing the mass extinction at the end of the Triassic Period, as well as slowing the recovery of life afterwards. The end-Triassic extinction took place approximately 201 million years ago. One of the largest mass extinctions of animal life on record, the casualty list includes many large reptiles that were early crocodile relatives and over 50% of marine invertebrate species. The event also caused major changes in land vegetation, and while it remains a mystery why the dinosaurs survived this event, when many other reptiles perished, they went on to fill the vacancies left by the now extinct species, alongside early mammals, lizards, and frogs and salamanders. This mass extinction has long been linked to a large and abrupt release of carbon dioxide into the atmosphere, which scientists had suspected was related to volcanic activity, but the exact source of this emission has been unclear. ’We knew this massive release of carbon dioxide and sulphur aerosols caused the extinction event in the oceans, but no one had yet shown that this was clearly a result of pulsed eruptions of volcanic activity during this time. The presence of the mercury peaks in sediments essentially from around the world strongly suggest the global reach of the effects of the CAMP eruptions, the climatic effects of which decimated dinosaurian competitors in the tropics allowing the dinosaur to expand ecologically and dominate the land for the next 136 million years,’ stated Dr. Whiteside. Because there are extensive volcanic rocks of the same age as the extinction, volcanic carbon dioxide (CO2) emissions had previously been suggested as an important contributor to this extinction event. Previous studies have also shown that this volcanism might have occurred in pulses, but the global extent and potential impact of these volcanic episodes has remained unknown. These volcanic rocks covered a huge area, across four continents, representing the Central Atlantic Magmatic Province (CAMP). 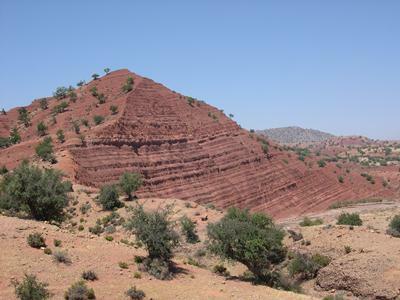 By investigating the mercury content of sedimentary rocks deposited during the extinction, the study findings revealed direct links in the timing of CAMP volcanism, CO2 pulses, and the end-Triassic extinction. Volcanoes give off mercury gas emissions, which spread globally through the atmosphere, before being concentrated in sediments. Any sediments deposited during a large volcanic event would therefore be expected to have unusually high mercury content. The team sourced six sedimentary sequences from the UK, Austria, Argentina, Greenland, Canada and Morocco, and their mercury levels were analysed. Five of the six records showed a large increase in mercury content beginning at the end-Triassic extinction horizon, with other peaks observed between the extinction horizon and the Triassic–Jurassic boundary, which occurred approximately 200 thousand years later.